These mines are a good place to make some extra money as long as you don't mind making frequent trips back to Golddale. There's a lot of sacks of gold and silver ore lying around that you can take to sell. Upon first entering the mines follow the passage until it opens up in a large room. You'll get a message about a barricade. Go into combat mode and use distance attacks to kill as many of the Sliths guarding this area as you can. Take note of the green runes on the ground between the two walls. These will explode when you step on them. Once you've cleared the area make your way to the door on the western side. Go through the door and be prepared to fight a couple more Sliths. This would be a good time to mention that there's Sliths scattered through the mines, so you might run into them at any time. Once you've cleared the entry area go to the west to find the bodies of those miners who didn't manage to escape. One of them has a Lightning Spray scroll on it. Now make your way back to the entry area and go up the stairs to the ledge with the doors leading north. Through the doors are a few more sliths and a U-shaped hallway. The first room in the middle of the hallway is a storage room containing a few items, including some Blessed Javelins. Even if you don't have anyone who uses Javelins it's a good idea to pick these up to sell. The second middle room contains the Slith Chieftain and his guards. The Chieftain drops a Crystal Charm when slain. There are two small storage rooms to the west of the U-shaped hallway. The northern room contains some chests with gold and silver ore, and the southern one contains the same things, but one of the chests in that room also contains a couple different elixirs. Now it's time to make your way into the mine itself. Go the northeast end of the U-shaped hallway and through the door to the east. When you come to a side passage leading east follow it down into the mine itself. 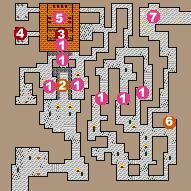 The mine is a bit of a maze, so I suggest just starting at the west side and zig-zagging your way through. When you get to the eastern edge of the mine check for a body about halfway up the map. This is the body of an Avernite, one of those sent before your party. Now go up the passage to the northeast corner of the mine. There's some Ursagi here, who've ambushed some Sliths. Going out the entrance on this side takes you to the other side of the mountain range, but it will also make the Runes near the entrance to the mine reappear. The mine is now clear, so make your way back to Golddale to get your reward from Mayor Rendell.